DIPRIP has entered a closed testing phase. We are now playing the game with a small group of dedicated testers, searching for bugs and polishing the details. We are very happy about the overall feedback so far. As a small teaser you can check out these few fresh screenshots taken during our tests. We are very close to releasing the first public version, prior to that we are now actively searching for dedicated server partners for our official launch. 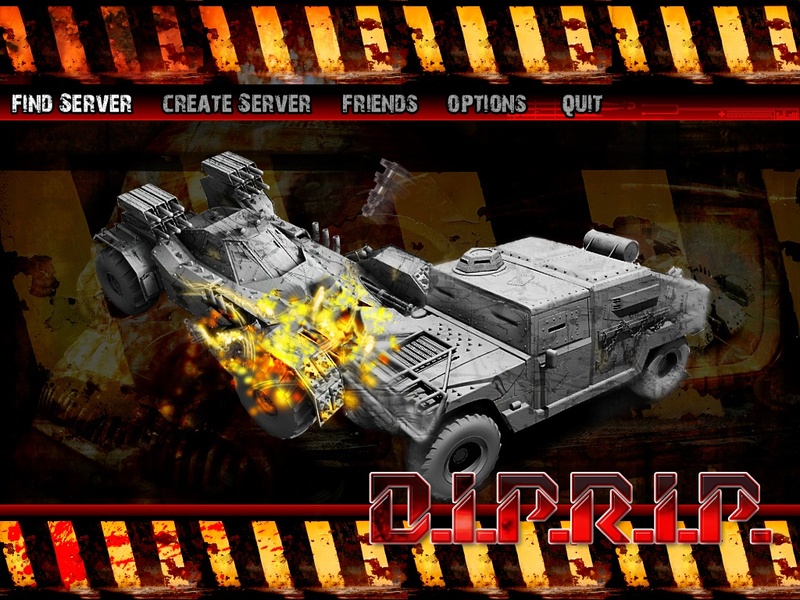 Please contact us at diprip@gmail.com if you have an available server. We will be providing our launch partners with DIPRIP server installers a few days prior to launch. We have updated our website's media section. We removed all of the old stuff and added some fresh screenshots. Also if you haven't seen our gameplay trailer yet you can check it out in the updated media section. Today we would like to proudly inform that D.I.P.R.I.P. has been featured in the PC Gamer UK Magazine Christmas 2007 Issue. It is a full page article with some screenshots. For those of you that can't get the shiny printed version we have found a location at which you can read it with just one click. Additonally while the game plays better and better, nearing its public release, we would like to share some new screenshots from our playtests showcasing intense car combat. It has been a while since we posted any news. Today we wanted to show a bunch of images with our new cars. Below you can see the hi-poly versions of the "Chaos 126p" and the "Bloody Mermaid". The Mermaid is a creation of Damian (Zuber) and is still "work in progress" so be sure to post some feedback. Additionally we have a low poly (12K) textured version of the Chaos126p. The skins are still work in progress but already there is a dispute amongst our team which one fits better. We would be happy to hear your comments about them. There is a poll on our forums where you can vote for one of them. The long promised gameplay trailer is ready! Now you can see in motion what we have been showing on screenshots for some time. It features all three maps that we are currently working on, two cars, new pickups and of course lots of multiplayer action. Check out the streamed video or if you are a more demanding user you can download the HD resolution version here. We would appreciate any feedback so stop by at our forums and let us know what you think. This week DIPRIP has been featured as mod of the week at the eGames magazine. You can read the full article and a short interview here (in German). Besides that we have some screenshots featuring the new Refinery arena. Lately we have been experimenting with new explosion effects. The effects are still work in progress so if you have any suggestions/comments what you would like to see please let us know at our forums. Last week we had the pleasure of being interviewed by Headcrab.pl and Pariah's Guild - the first interview is in Polish and the second one in English. "Witam. Na poczatku moze nieco opowiedz jak wpadliscie na pomysl stworzenia modyfikacji, czy dlugo poszukiwaliscie osob chetnych do wspolpracy? Witam. Na pomysl stworzenia moda wpadlismy dobrych kilka lat temu. Na poczatku mial to byc calkiem inny projekt ale w koncu zdecydowalismy, ze bedzie to DIPRIP. Osob chetnych do wspolpracy raczej nie poszukiwalismy :) Wszyscy z nas znaja sia od lat ze szkoly, studiow lub sasiedztwa... wystarczylo zapytac czy chca "porobic z nami moda" i tak sie zaczelo :) ..." - here is the full interview. "If there’s one thing I realized about the PC gaming industry, then it will be the fact that the racing game genre is virtually absent on PC’s. Could it be the controls? What about controlling the camera? Maybe playing racing games on a console like the PS3, 360, or a Wii is just much better. Well, Pawel Lekki and his dedicated mod team don’t think so, with their upcoming project, D.I.P.R.I.P (Die In Pain, Rest In Peace) I interviewed him about this groundbreaking project..." - here is the full interview. While the basic weapons are being equipped with new fancy visual effects we have some new in-game screenshots to share. We have a new textured "Hedgehog" vehicle in action so stop by and take a better look. Don't forget to post your comments on our forums. The promised movies are a bit delayed at the moment but they should be ready quite soon now. Today we have a small content update that we would like to share with everyone. 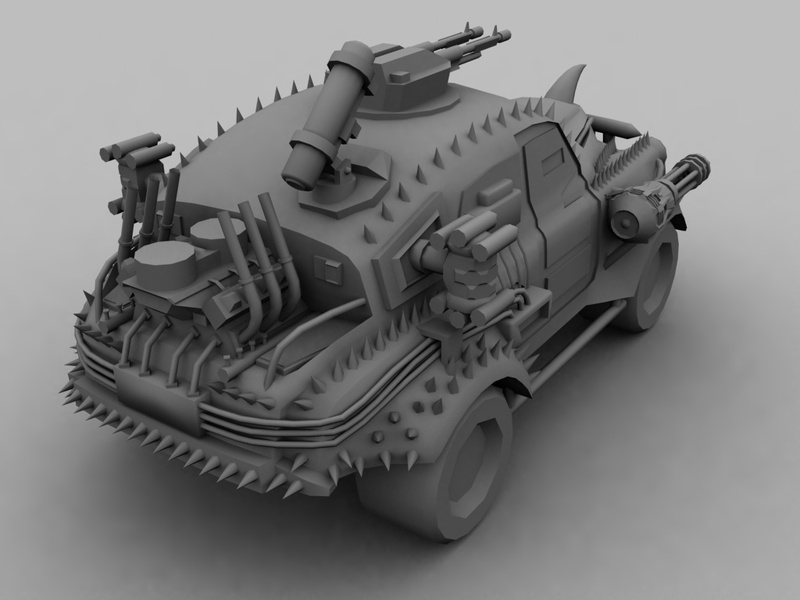 We' ve been working on adding more weapons to the Ratmobile vehicle and so you can see a few new renders. 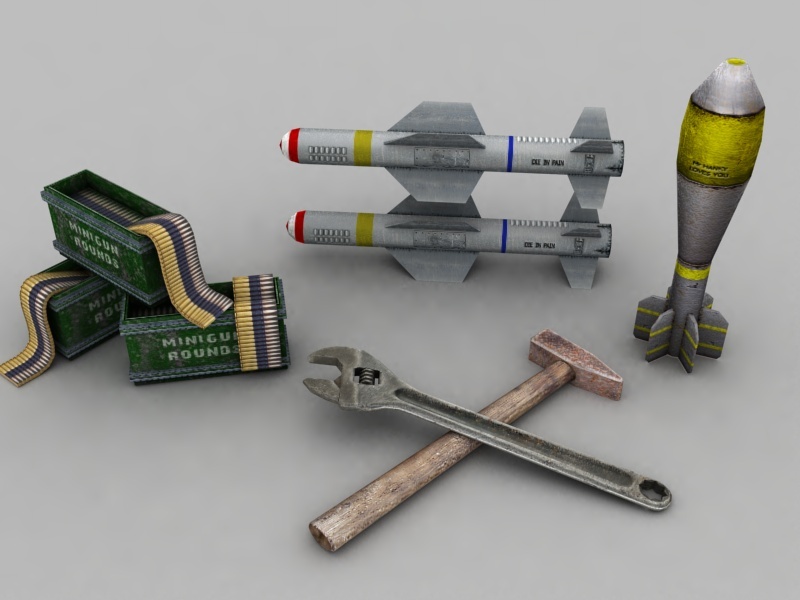 Now the model has all weapons that will be available in the first DIPRIP release. 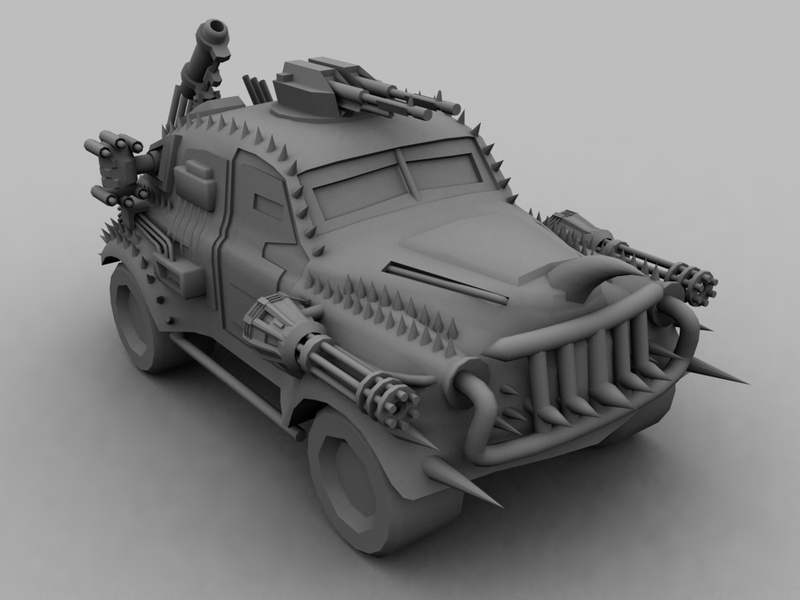 Following the new Ratmobile images we have a bunch of ingame pickup models and countryside props. We have decided that it will be best when the pickups will be represented as "3D icons" floating above the ground for better visibility. 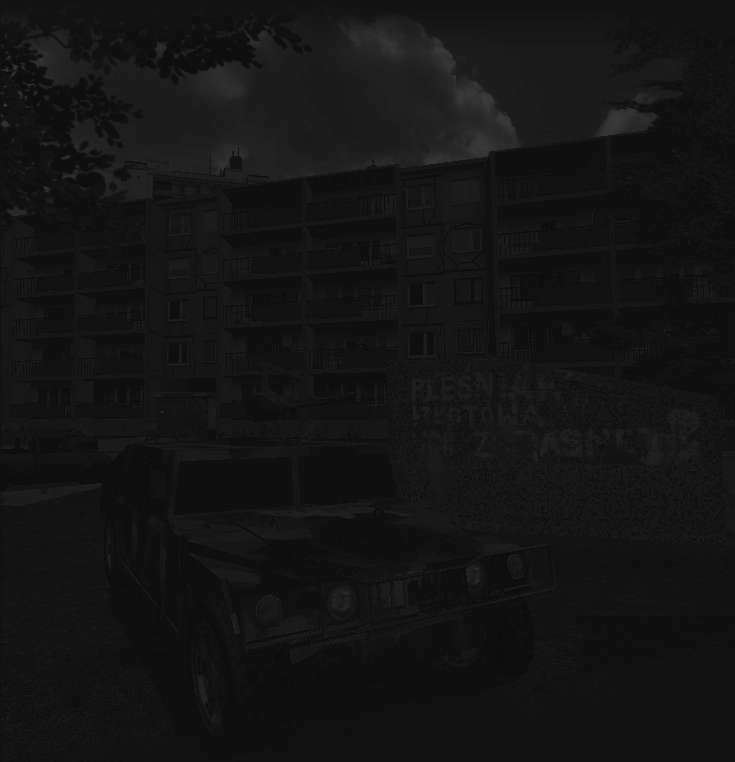 Each pickup in the game will have a unique color glow so it is easier to be distinguished. We've been also experimenting with a new look and feel for the game menus and HUD. So far we are having mixed opinions about the menu style. Our forums should be online before the end of the week so you can register and express your feelings about it. Additionally we have created a low poly version of the Hedgehog vehicle originally created by Damian Zubrzycki. It has about 12K polygons and fortunately haven't lost much of the detail included in the 1 million poly version. At the moment it is being textured so it should be roaming in the game next week. 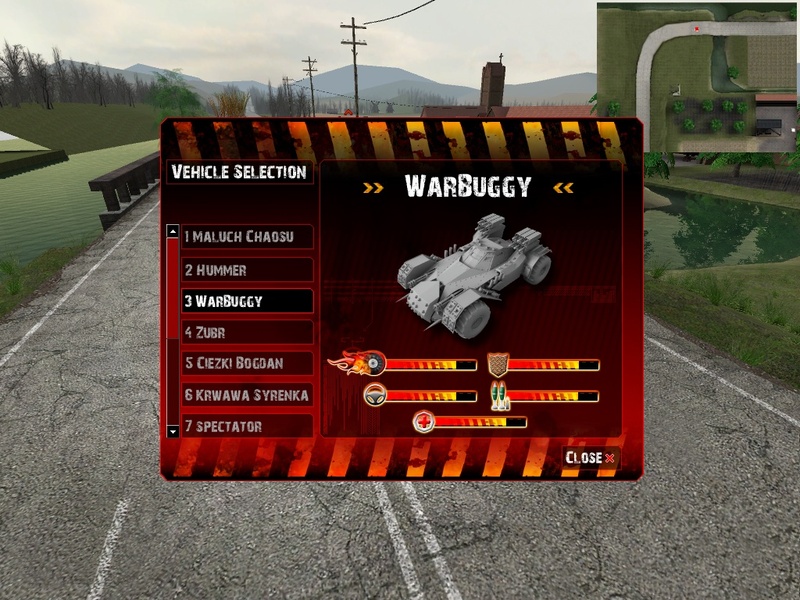 Next week we are expecting to have some movies from the game with the driving vehicles, moving pickups and changed level layouts so stay tuned. It has been quite a while since we updated our page and to be honest also a long time has past since we have done anything for the mod. The good news is that we are back on track with a lot more power. For more than 2 years all of our team members were working on mobile games. We helped to deliver several big mobile titles working at Gamelion for quite a few big publishers. You can check out more about the company and the projects in which we have had the pleasure to work at the Gamelion web page and the company's Blog. The time has come to get back to the "big screen". We are again working on D.I.P.R.I.P. 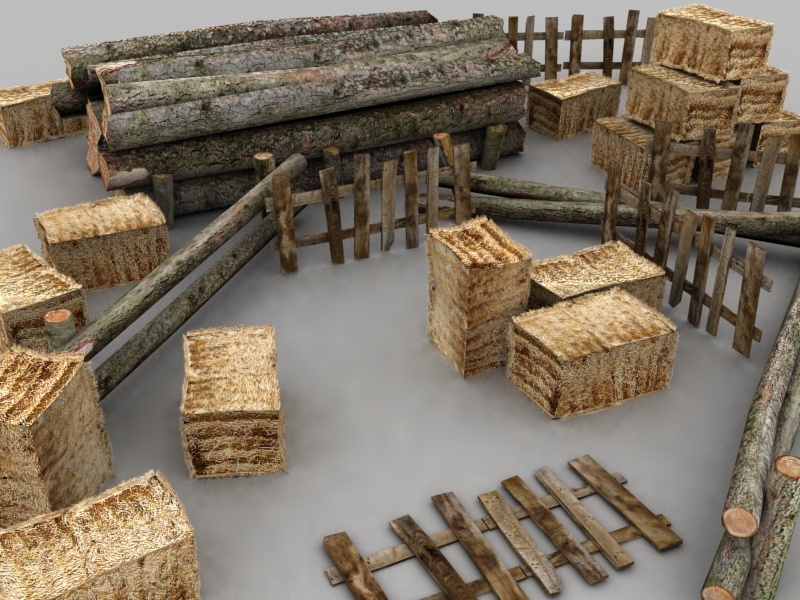 For a few days already the work has been progressing on all fronts: programming, level design, 2D/3D graphics. You can expect some more news and updates on our page quite soon.